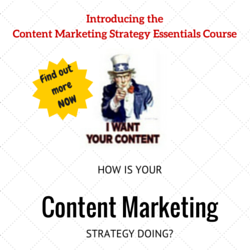 Is MINT in your international online marketing strategy? So I’m not suggesting that herbs are the way forward, or trying to get you to focus on the ice-cream market globally (although I can think of worse things!). No, I’m talking about the latest acronym which is floated about regarding which countries will become economic powerhouses and offer great potential for growing your business. You’ve probably come across BRIC – Brazil, Russia, India and China – which was coined in 2001 by Jim O’Neill and nobody would deny that those markets have all seen exponential growth and offer huge potential for global businesses (China will soon overtake the US as the biggest online economy globally). In 2014 Jim O’Neill came up with the next list of countries to focus on – Mexico, Indonesia, Nigeria and Turkey. In the past few years, these markets have seen an increase in internet penetration and ecommerce, and according to Jim have the potential to match the performance of the BRICs over the coming years. Of course, these markets will not be appropriate targets for every business, and in-depth research needs to be conducted specifically around your business and target audience before you make a move. 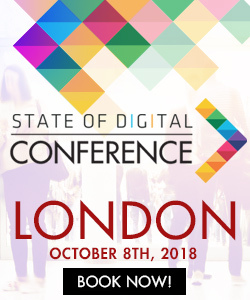 However, here are a few insights into online behaviour in these markets which might help paint a picture of what to expect and how to capitalise on the low levels of competition and a growing appetite for the internet. I’ve used the Google Consumer Barometer tool to compare these markets. It’s a useful, free tool which covers over 50 countries and gives insight into a wide range of consumer behaviour and preferences. How Many People Are Connected? While more and more people are becoming connected to the internet, penetration rates in all of these markets are all still under 50%, in some cases much lower, meaning that there is still much room to grow – compared to mature markets like the US, UK and Germany which have now stagnated. It’s not just all about percentages though – Nigeria may only have less than 40% of the population online, but they are still in the top 10 biggest internet populations globally. So there are more internet users in Nigeria than in the UK, France and South Korea. 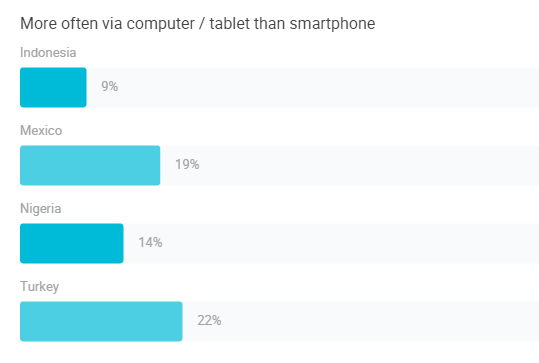 The key thing to note here is the prevalence of mobile. Mobile is important everywhere, but in some countries it already far outweighs desktop, making a mobile-first strategy the most logical and efficient way of entering the market. 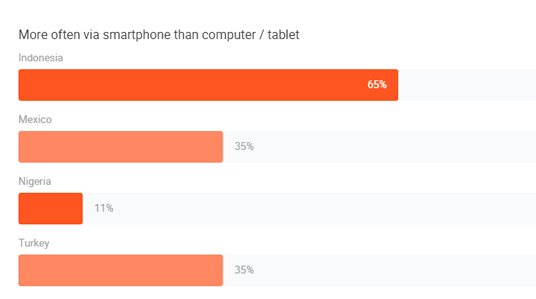 In all of our MINT markets, other than Nigeria, Smartphones are the clear winner, beating tablets and desktops as the preferred way to access the internet. And the difference in Nigeria is pretty marginal too! Bear in mind that even though mobile is leading the way – not everybody has a smartphone! The old faithful feature phone is still the only device for many people in emerging markets. What Role Does the Web Play in Research? 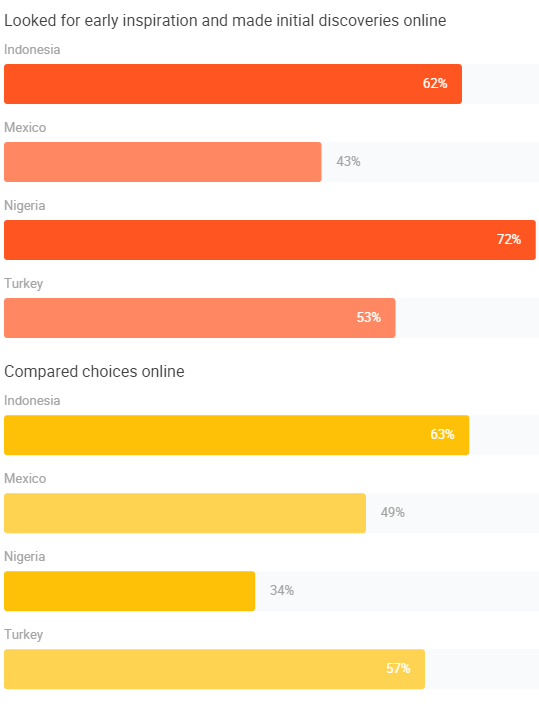 Despite ecommerce still being in the early stages in these countries, the principle of using the web to research purchases and gather information is gaining traction. The chart below shows the number of users in each market who use the web to find inspiration and compare choices. Therefore, even if you do have a physical presence in the country or use resellers, by failing to provide any information online about your brand and/or products, you could miss an opportunity. Search engines were the most popular means of finding information about potential purchases and brands, scoring higher than social networks, brand websites, retail websites and forums in all 4 markets. 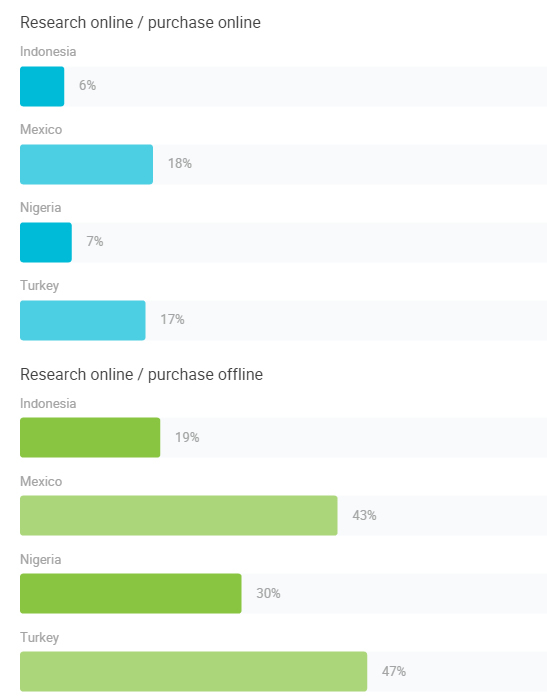 In all 4 of the MINT countries, there is still more of a tendency to by offline than online……but even if they do go and purchase in a physical store, users will research online and are likely to have already made their purchasing decision before they actually set foot in a shop. Another issue in developing markets is trust. Both lack of familiarity with brand, as well as concerns over the security and reliability would be potential barriers to getting a purchase directly on your website. 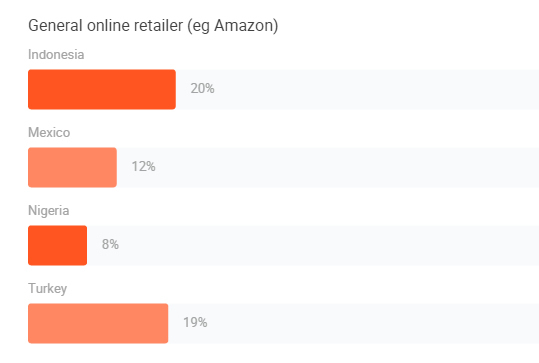 When asked on what type of website they made their purchases, General Retailer sites like Amazon were by far the most popular, outperforming brand websites, department stores and even supermarkets. How Do People Get Their Goods? It’d be natural to assume that when ordering online, people would expect to have their goods delivered. 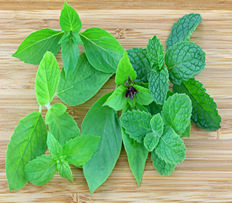 Yet in our MINT markets, collection from the store is the most popular method. In Nigeria 85% people collect from store, compared to just 4% having it delivered domestically. International deliveries are even less popular in all markets. Ensuring you have the appropriate options for your target market, throughout every stage of the purchase journey is a must. More and more businesses are looking to international markets as a way to grow and while the MINT markets may not be top of your list, the forecasts suggest that we will be hearing much more about them in the coming years. Of course, launching in any new market is challenging, more so in those where physical and virtual infrastructure is not as developed as we are used to but those prepared to take on the challenge will reap the rewards. Are you already targeting the MINT markets? What has your experience been?